The NLL’s 2014 awards season saw a tight three-way race for the Goaltender of the Year trophy, with Matt Vinc, Aaron Bold and Anthony Cosmo all making very good cases for the top honor. Bold set a league record for wins (15) and was tops in goals against average (8.73). Vinc was second in wins (12) and GAA (9.56) but had the best save percentage (.798). Cosmo led the league in minutes played (1063:36) and set a new league record for saves (752). In the end, the voters went with Vinc for the fourth time in five years (although, personally, I would have picked Cosmo). This year it is looking like a two-horse race, with Bold and Vinc once again going toe-to-toe for the award. Once again, Bold is leading the NLL in GAA (9.41) and wins (11) while Vinc is second in both categories (9.51 GAA, 10 wins). And once again Vinc leads the league in save percentage at .807. There are a couple things weighing strongly in Vinc’s favor this year. Although Bold and Vinc have played a similar number of minutes, Vinc has faced 87 more shots and stopped 89 more. Also, just a week after Bold’s Edmonton Rush tied the NLL record by holding Vinc’s Rochester Knighthawks to just three goals, Vinc responded by holding the Minnesota Swarm to a record-breaking two goals. 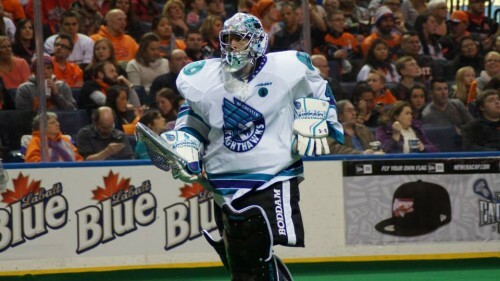 In Bold’s favor is the 16-3 win over the Knighthawks, decisively outclassing Vinc in their sole head-to-head contest this year, the fact that Bold is the league leader in two of the three key metrics for goalies in the NLL and the fact that Bold has done all that while logging the most minutes of any netminder in the league this year (956:54). My gut instinct is that this is Vinc’s award to lose. As a player who is on the wrong side of 30, he should be showing significant signs of slowing down; instead he’s maintaining a extremely high level of play and that will likely tip the vote in his favor. But let’s give Bold the credit he is due—as a starter for the Rush he boasts a 40-22 record and has never finished worse than third in GAA in the league. Not even Vinc can say that. 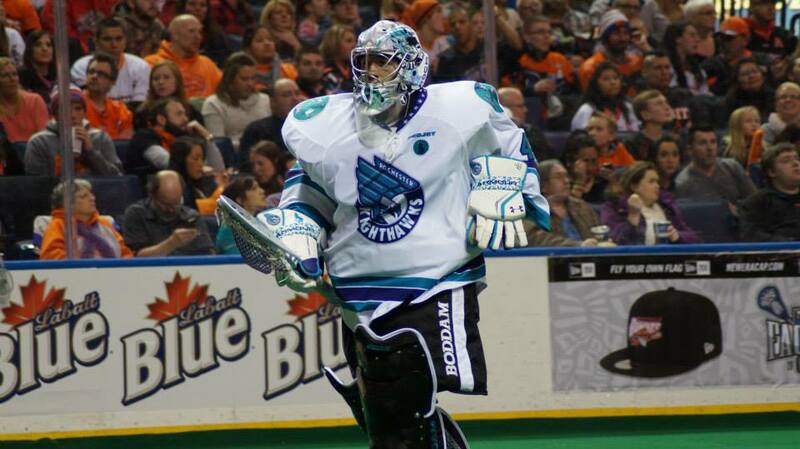 Vinc and the Knighthawks next face the New England Black Wolves on Saturday, April 25 while Bold and the Rush take on the Minnesota Swarm later that same night.